The Oakland 1175 in an enhanced Keter shed, made to endure heavy weather conditions. Keter Resin Garden Sheds are well known for their beautiful designs and top quality products. And the Oakland range will not disappoint! The Oakland 1175 is the largest in the Oakland Keter range and is great for anyone looking for a resin product but worried about durability. These sheds have been manufactured to endure heavy weather conditions in extreme zones. I'mm talking about heavy rain, the wind and even snow! It has sturdy double-wall panels and steel reinforcement to ensure it can handle hard weather conditions. The colour won’t fade due to the UV Protected Resin. 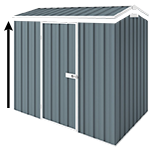 Its durable roof supports heavy loads for heavy rains and rare snow regions in Australia. The Oakland 1175 is a great size for plenty of storage space or even a studio. They are also easy to move location. Multi-shade colour & textured feel PLUS walls can be painted to personal preference! Now you can own a beautiful shed with generous storage space. (Please note they are not cyclone proof). Shed comes with 10-year manufacturer warranty. -- Please Select --YES! I want a Bonus Deck Box. NO thank you.